Check out our new digital flip-page version of The Fly Shop's 2016 South America Travel Planner online. Your international angling experience at The Fly Shop.com just got a whole lot easier. 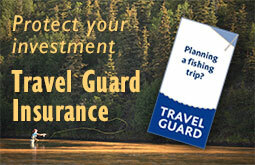 Protect your fly fishing investment with insurance offered by Travel Guard. Provides coverage for trip cancellations, travel delays, lost luggage, medical emergencies etc..
Click Here and shop for insurance! Our latest videos showcasing the spoils of a Kamchatka fly fishing adventure. Get a taste of the dry fly fishing, mousing, big rainbows and the remote, pristine Kamchatka wilderness. Click Here to view our videos. Get up-to-date travel reports for our Signature Destinations. Have a trip planned and want to know what equipment you need or what the fishing has been like, then this is the perfect place for you. Click Here for travel reports! 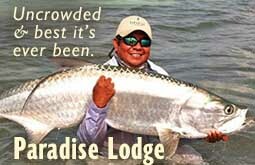 Famous for tarpon and snook, Paradise Lodge offers outstanding bonefishing and permit fishing in the most scenic and remote flats of the Mexican Yucatan. 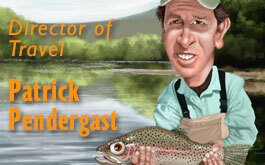 The director of The Fly Shop's travel departemnt is the empiome of fly fishing travel. His enthusiasm, dedication, expereince and sense of humor is what makes your next fishing vacation a great one. Find out more about Patrick Pendergast on his profile page found here. These lodges carry our total endorsement, promise of satisfaction, and iron-clad guarantee the quality of accommodations, experience, and angling is going to be exactly as advertised. They're represented exclusively by The Fly Shop and our network of travel agencies and fly shops. From the remote, hard-core, Kamchatka and Alaska bush camps to our luxurious Tierra del Fuego sea trout lodges, all these world-class fly fishing experiences share common threads that extend beyond great angling. Search our site by lodge name.